Formentera, with an area of 84 square kilometers, is the second smallest of the inhabited islands in the Spanish autonomous community of the Balearic Islands. They, together with Ibiza and several smaller islands, are the archipelago of Pitiusas. The Solitude is especially paired by supporters of relaxed seclusion estimated with the luxury of fine entertainment. In one of the top 10 beaches in the world, a secret that few know is hiding. Nestled among the junipers and pines of Illetas beach a wooden beach bar seems to merge with the dunes of the Natural Park of Salinas. Inheriting customs of pirates and buccaneers, so characteristic in the history of these islands, the place name is guessed at the flag flying on its roof. El Tiburón is “the beach club” where people go to eat well, to enjoy good company, to dream with the sunset and to listen to good music. Unpretentious. And maybe that is the secret to that under its roof Formula 1 drivers, Michelin star chefs and founders of italian fashion empires share table, music and confidences. 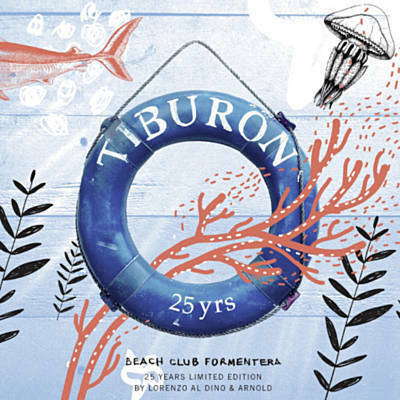 To celebrate the 25th anniversary of the Tiburón Beach Club, resident dj Lorenzo Al Dino has scoured his record box with a licence for realness. After his last compilation for the highly recommended Jockey Club which is among the 3 most successful compilations this season in Ibiza, he makes a huge step to an even deeper selection of outstanding performance. This compilation is a declaration to the Balearic Islands, always paired with interesting details that are beyond the usual clichés. Those who love the combination of jazz and electronic sounds in addition to surprising turns, will take pleasure. CD1 impresses with lounge, easy listening, and smooth jazz tunes. Wolfgang Hafner - “Piano Man” (with the German singer Max Mutzke) and Monte La Rue - “In the Mood” are among the highlights. The sound has become more edgy and enters with catchy melodies into the head of the listener with positive thoughts to help you go after our goals. CD2 shines with a dedicated selection of deep house, chill house and vocal house sounds. Among others with Kidnap Kid - “Moments”, just on high rotation on BBC1 and Joachim Pastor ft Mischa with “Fever”, a Basement Mix. “Just Love” by Lorenzo Al Dino completes this ultimate soundtrack for your absolute favorite location.